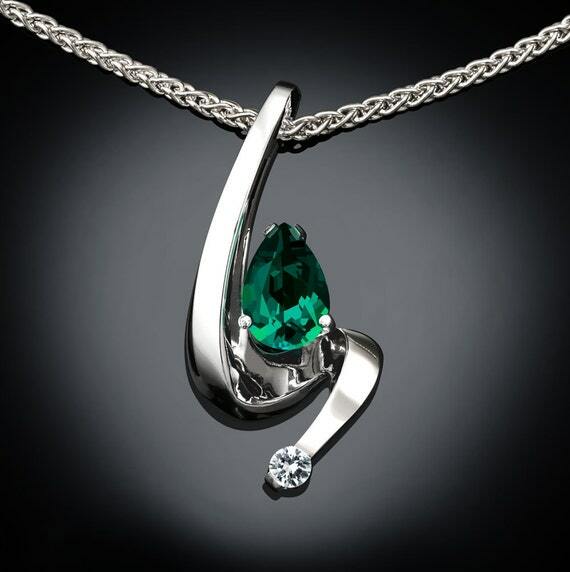 There is a vast range of birthstone jewelry online – from inexpensive pretty trinkets to highly valuable fine jewelry. And there are literally millions of online choices – for example a search on Google for the May birthstone ’emerald jewelry’ returns 15 000 000 (that’s 15 million) results! Even narrowing the search to Amazon’s jewelry collection, the list returned 130 000 items, so this vast sea of choices is pretty daunting! So Where Do I Start ?? To find that elusive gift it helps to first decide on a broad category as a starting point. 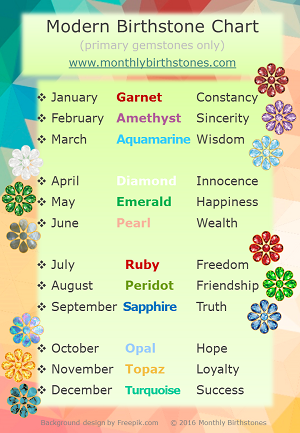 We have grouped the birthstone jewelry into three categories. 1. The first category is ‘Fine Jewelry‘ which is the term used to describe pieces set in precious metals such as gold or platinum and usually includes diamonds, thus this category is the high value jewelry. 2. The next category is ‘Fashion Jewelry‘ which includes designs using plated metals or alloys like sterling silver and prices are mid-range. 3. The third category is ‘Artisan Jewelry‘ which are pieces made by local craftsmen and women often with crystals and beads. Pricing will depend on the uniqueness of the piece, the value of the gemstones and the reputation of the artisan. Choosing the best jewelry gift will depend on the occasion and the personality of the recipient. Fine Jewelry is a suitable gift for a special anniversary of a close family member, whereas Fashion Jewelry is appropriate for anyone on normal birthdays. Artisan Jewelry is very unique and great for that friend or family member that has everything! A traditional person will likely prefer a Fine Jewelry classical piece, whereas someone who is trendy will appreciate a Fashion Jewelry item and those into their arts and crafts will love a handcrafted Artisan Jewelry gift. 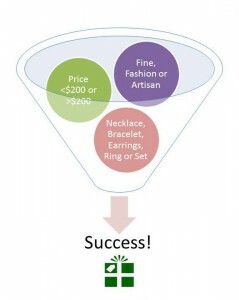 Deciding on a price range narrows down your choices considerably, for example if I then filter on Fine Jewelry in the $200 to $500 range of ’emerald jewelry’ on Amazon, I get about 15 000 results, still a bit scary but far better than 130 000… Most online jewelry stores have a filter on price range so you can view just the pieces in your preferred price bracket. Be careful of heavily discounted jewelry as these are likely to be low quality pieces. As a general guideline good quality Fine Jewelry will start at $200 and progress into the $1000’s whereas there is a wide range of excellent Fashion Jewelry and Artisan Jewelry under $200. Then the last step is to decide what type of jewelry to choose – Necklace, Bracelet, Earrings, Ring or Jewelry Set. Most online jewelry stores have filters on the type of jewelry, and some even have choices within each type, for example all the different type of earring styles – hoop, stud, dangle etc. So now if I filter my Amazon search to Fine Jewelry + Gold + $200-$500 + Bracelets I only get 15 results! Be sure to also select Gemstone = Emerald otherwise you will also get ’emerald cut’ jewelry which is a style of stone shape. So once you have made these three major decisions you will be well on your way to finding that perfect gift! Good luck! Have a look at our monthly pages where there are samples of recommended artisan birthstone jewelry – for example May Birthstone Jewelry. Bookmark this article How to Find Birthstone Jewelry Online – Narrow your Choices from 15 million to 15! Thanks for your help! Happy Holidays. Thanks so much for this helpful advice! I love to have lots of choices but sometimes it can get overwhelming if there are too many.